Working from home can be incredibly convenient and cost-effective. You are saving money and time by not having a commute, not having to buy and wear business attire, and not needing to purchase meals and snacks on the go. The downside is that you are entirely responsible for making your home office as professional as it would be in a business office setting. 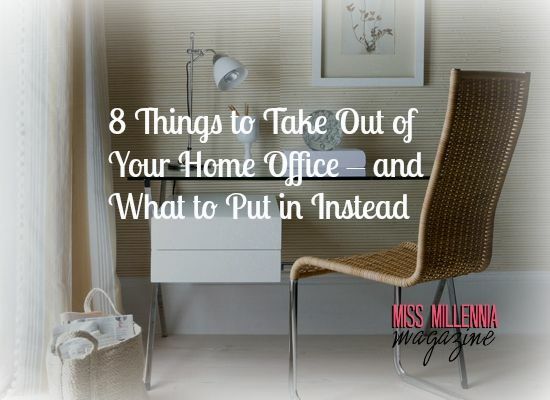 Take some of that money you are saving and turn your home office into a space as productive as a commercial office by swapping out these items. Sitting all day at a desk in a chair is not good for your health, but there are steps you can take to make it less stressful on your body. The first step is to toss out that cheap desk and chair and invest in ergonomically correct furniture. Ergonomic chairs can range from $100 to $1,000, so buy the best chair that you can comfortably afford. Desks that adjust from sitting to standing height will allow you to reduce the amount of time you are sitting during the day. Clutter is a major culprit in reduced productivity. Not only do you waste time trying to find what you need, it has a negative effect on morale. Organizing your workspace will not only make you more productive, but you’ll feel better too. Go for wireless when it comes to your electronics to reduce the amount of cords snaking across the desk, or use cord clips to keep them tucked away. Use a desk organizer to keep your pens, papers and other supplies neat and tidy. Bookcases with canvas bins can add a pop of color to the space and hide unsightly necessities. Keeping up with the latest technology can be overwhelming, but it is necessary. Your home office will need to be equipped with software that is compatible with what everyone else in your field is currently using. Nothing is more frustrating that not being able to view a file because your software doesn’t support it. Make sure your hardware can handle all your work needs as well. An all-in-one printer will allow you to print, copy, scan and fax documents like a major corporation. Think about how you will communicate with others and purchase top-notch tech, such as video conferencing equipment. Chances are if you were working in an office building, there wouldn’t be a TV blaring in the background or kids running around screaming. Make sure your home office provides you with a buffer from these distractions as well. Close the door while you are working and dedicate time away from your family and friends to focus on work. If the room you are using as a home office has toys, a television or a lounge area, remove it so that your space is dedicated to work only. Doing this will also allow you to write the space off as a tax deduction. Improper lighting can be a strain on your eyes and lack of natural light can cause depression. To combat eye strain, install proper task lighting and get an LCD computer monitor, which is easier on the eyes. To increase natural light, consider having a window installed if there is not one already in the room. If you already have large windows, make sure you diffuse the incoming light with sheer curtains so it doesn’t cause glare on the computer screen. If you are working from home, you’ve already broken the corporate 9-to-5 mold, which means you are probably a creative and innovative thinker. Ditch the bare walls and depressing décor. Add some inspiration to your space with a dream board or handmade wall calendar that will keep you on track for your goals. It can be so tempting to stop and snack when your own kitchen is only 20 feet away, but this can throw up a roadblock to productivity. Instead, prepare your snacks and meals ahead of time like you would if you were leaving home for the office and keep them close at hand. Set aside an area of your office to include a mini-fridge and a single-cup coffee maker. You’ll be able to refuel without disrupting the flow of your workday. Last but certainly not least, invest in a powerful modem and high-speed Internet. Having a home office means you’ll be running multiple devices at any given time including your computer, all-in-one printer, tablet and phone, so having a network that can support your tech is imperative. A reliable connection is also important. If you have to make a video conference call you can’t afford to have choppy or slow reception. Investing in these updates to your home office will greatly increase the value of your work time as well as keep you healthy and happy.